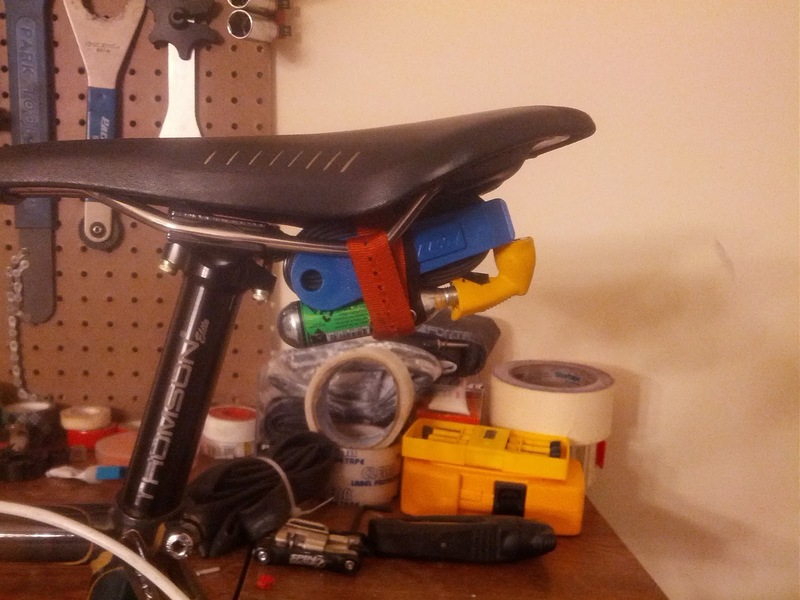 Let's face it, a lot of people ride around with giant saddlebags dangling off the back of their saddles. Besides ruining the lines of the bike, it rubs against your legs, and it swings back an forth like a...well you know. Seriously, it's an embarrassment. If I see anyone riding around with a giant saddlebag, I am just going to assume they also have Trucknutz on their car. Obviously, you've guessed that I don't like saddlebags. 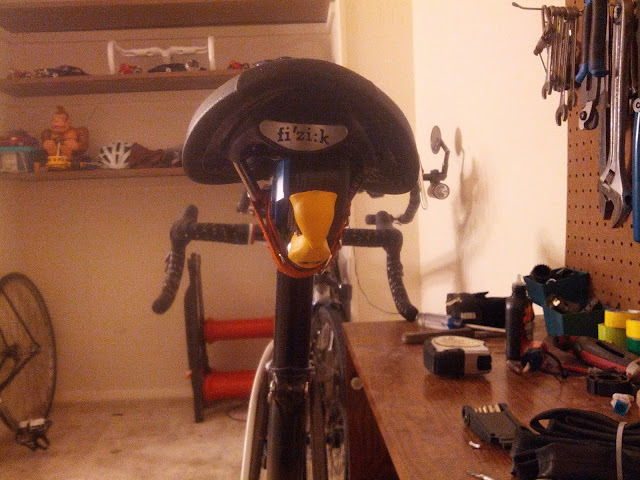 However, since going full time on my 'Nago, one of the problems is that it only comes with 1 bottle cage mount. Now, this looks totally pro, but forces me to carry my second bottle in my jersey's center pocket. This isn't really an issue, but in the interest of weight distribution, I had to move stuff out of my pockets. Thus, I recently stumbled upon a tidy and totally pro looking solution using an old nylon watch strap. 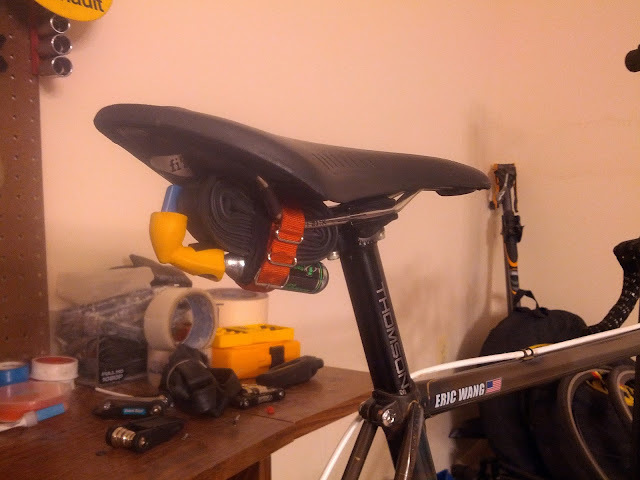 A double layer of electrical tape is wrapped around the folded tube's circumference to prevent damage from the saddle and seatpost. This also means I always have 8 to 10 inches of electrical tape on hand, which is really useful. The nozzle is threaded onto the CO2 cartridge until it just tightens but doesn't puncture. It's then held in place by a small piece of electrical tape (see a pattern here? I love this stuff). Finally, a small piece of electrical tape covers the open end of the nozzle to prevent road debris from getting in there. 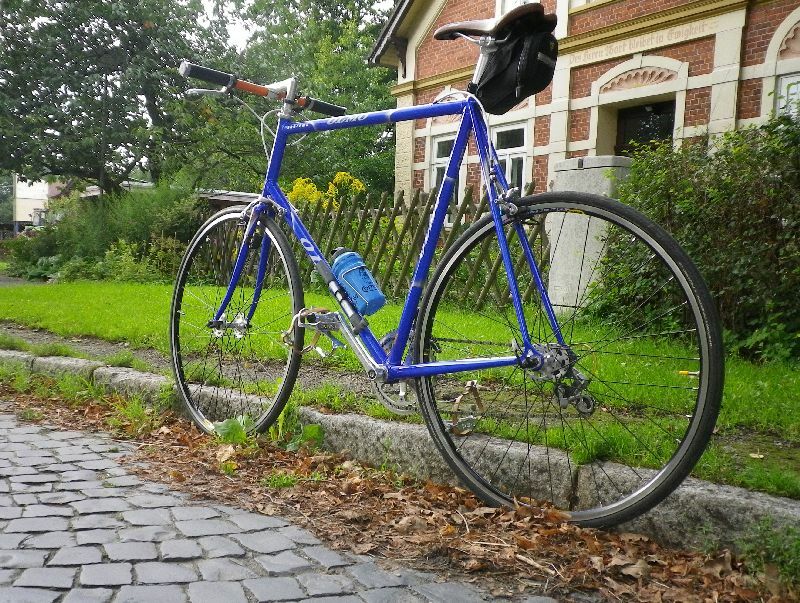 So far it's proven really robust, with no movement even over rough roads. Also the whole package is very narrow, so there's no rubbing during pedaling. Nice. Rad and pro. Perfect combo. leaving your tube exposed like that will dry it out, leaving it useless if you actually get a flat.